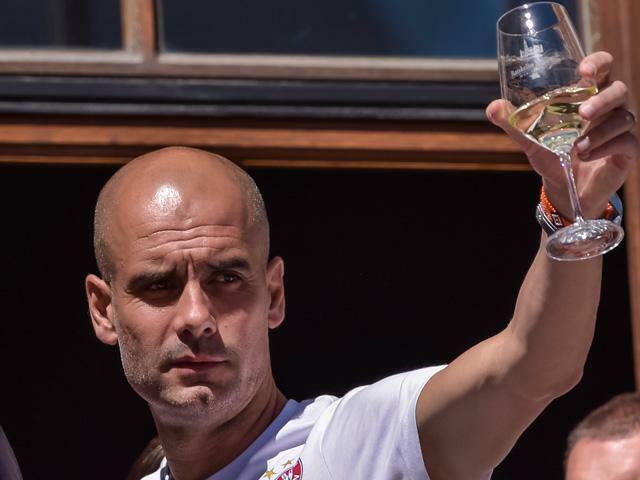 Will Pep Guardiola be toasting title success in May? "Pep Guardiola takes elite players and makes them better, and he has a hugely talented squad at his disposal. If he can communicate his ideas quickly and clearly, City can justify their tag as favourites to win the title." They say all good things come to those who wait, and Manchester City have waited a long time to land Pep Guardiola, the coach of their dreams. The Catalan has a breathtaking CV, headlined by three league titles apiece at Barcelona and Bayern Munich, and two Champions League successes. His spell in Germany is often derided for his failure to make Bayern European champions, but it's significant that the Bavarian giants were desperate to keep him. Unusually, Bayern allowed themselves to be strung along like doe-eyed teenagers, while Manchester City ironed out the final details of "Project Pep". Some fear City's squad will take time to adapt to Guardiola's methods, but I disagree. Although his tactics are complex, he is excellent at getting his message across, and he improves players who are already elite. The likes of Kevin De Bruyne, Vincent Kompany, Sergio Aguero and David Silva are outstanding, but Guardiola can give them an extra 10% that could prove crucial. Two new signings from Germany will further enhance City's title push. Ilkay Gundogan is an intelligent and mobile player who will help acquire the midfield mastery Guardiola's tactics demand, and 20-year-old forward Leroy Sane is a defender's nightmare, a heady mix of pace and skill. If City can acquire the ball-playing centre-half they are seeking, they'll be set up to win the title in Pep's first campaign. Those who overvalue "Premier League experience", and feel Guardiola's had an easy ride in Spain and Germany, are in for a big shock. After amateurishly floundering since Sir Alex Ferguson hung up his hairdryer, Manchester United suddenly mean business. After prevaricating about whether Jose Mourinho would be the right fit for United (their concerns were about the man, not the coach), the Red Devils have held their noses and made the pragmatic choice. Mourinho is a proven winner, and lifted the Premier League trophy just two seasons ago, before an implosion at Chelsea that we may never fully understand. Mourinho has been given shiny new toys to back up his bid for glory. Playmaker Henrikh Mkhitaryan was the best player in the Bundesliga last season, muscular ex-Villarreal centre-back Eric Bailly might well have "built for the Premier League" tattooed somewhere on his person, and Zlatan Ibrahimovic will be a force of nature both on and off the pitch. Behind the gloss of the striker's vanity and silliness is a fierce competitive spirit. Zlatan is a winner, the kind of leader United have needed for some time. Whether Paul Pogba returns to Old Trafford or not, United have quality across the board, and they've made a huge upgrade in the dugout. I've nailed my colours to the City mast, but United will push them hard. Just as the two Manchester giants have made significant coaching changes, Chelsea have begun what they hope is a successful new era under Antonio Conte. Having won three straight Scudetti at Juventus, he took a limited Italy squad to within a penalty-shootout of reaching the semi-finals at Euro 2016. Unlike some of his predecessors at Stamford Bridge, his playing career commands respect, as he won five Serie A titles and a Champions League with Juventus. He simply adores winning - even his daughter is named Vittoria, which means victory. With Conte's man-management and tactical nous, Chelsea have a chance of pushing for the title, and they won't be distracted by European entanglements. N'Golo Kante is a huge signing from champions Leicester City, and his relentless ball-winning in midfield can provide a platform for the forward players. Eden Hazard effectively took last season off, but is still wonderfully gifted, and the proposed re-signing of Romelu Lukaku would be masterstroke if Chelsea can pull it off. With their focus purely on the league after last season's disaster, I think Chelsea look a good bet for a Top 3 finish at [1.91]. Cliches are to be avoided in journalism, but Arsenal have become one in their own right. They are the archetypal nearly-men, and the way fans celebrated finishing above Spurs last season spoke volumes. Supporters should've been furious that the dramatic 2-1 win over Leicester in mid-February didn't lead to a title push. As the Foxes surged to glory, Arsenal were left spluttering in their dust. Arsene Wenger has at least broken with tradition by signing a top-class holding midfielder in Granit Xhaka, and I think the former Borussia Monchengladbach star will excel. However, Wenger is too tactically intransigent, and unless the Gunners make significant additions in central defence and attack, they might be worth laying in the Top 4 market at [1.74]. There is much to admire about Mauricio Pochettino's Spurs. They play attractive football, they feature some of English football's brightest young talents, and they have finally broken back into the Champions League. That said, a golden opportunity to win the league went begging last season. With ailing rivals back on their feet, and the potential distraction of a Champions League campaign, will they get another title shot? Another top-four finish would be a fine achievement. Liverpool are heading in the right direction under their charismatic German boss Jurgen Klopp, although the pain of losing two cup finals will linger for a while. The Reds have done some very sensible transfer business, but there is still defensive fragility, and the loss of new keeper Loris Karius to a broken hand is a blow. I expect steady progress rather than a title bid, and given that the Reds finished eighth last season, there's an argument to say [1.4] for a Top 6 Finish is too short. After pulling off one of the most remarkable feats in the history of sport, let alone the history of football, Leicester City now face the daunting task of defending the Premier League title. The galling loss of N'Golo Kante may be mitigated by the arrival of technically gifted midfielder Nampalys Mendy, while summer recruit Ahmed Musa and the excellent Jamie Vardy give the Foxes pace to burn in attack. Given that Vardy finished just a goal behind Harry Kane in the top scorer race last term, and that Leicester are still set up to play on the counter, he's worth a look at [4.0] in the Top English Goalscorer market. It seems unlikely that the Foxes will retain their luck when it comes to injuries, and although I suspect they'll spring a few surprises in the Champions League, the squad doesn't look strong enough to fight on two fronts.